Mpt Precision turning – Precision turned parts, brass parts manufacturers. We are an Italian company based in Altavilla Vicentina, in the province of Vicenza. We have a strong international vocation and we export over 90% of our production. We are specialized in the production of turned parts that are used in hoses, heating, automotive, solar, high pressure pumps, sensors, electronics, pipes and gauges. We are proud of our work and of the quality coming out of our production lines, objects accurately made, from both the technical and aesthetic point of view. We seek every day materials and innovative solutions, with an eye to environmental issues and the containment of waste. micro cnc, machined components, precision cnc machining,mmetal machining centre, cnc machined parts, sheet metal parts, car parts manufacturers, metal machining services, precision engineering services. Since the establishment of the company the management of MPT Srl sustained the importance of working with focus on customer satisfaction, with respect for the environment and with human resources involved, valued and respected. These principles resulted in the certification of MPT’s Quality Management System according to the standard ISO 9001:2015 and the Planning System and Business Management according to the norm D-1001:2008,in highly advanced technical solutions to reduce the environmental impact. A Code of Conduct summarizes the commitment and the respect of MPT of its Customers, its employees and all stakeholders. All personnel shares and respects the principles contained therein. M.P.T. Srl was established in Vicenza on the will and the experience of Mr. Antonio Matteazzi and stands now as a professional and reliable partner of large European companies, leader in various manufacturing sectors. The company produces turned parts used in hoses, heating, automotive, solar, high pressure pumps, sensors, electronics, pipes and gauges. We work on customer’s drawings with lots of high and medium quantities, where the range of work is primarily comprised between diameters 3 and 25 mm. The company structure is professional, dynamic and compact, so as to ensure a high level of service, organized and above all flexible. 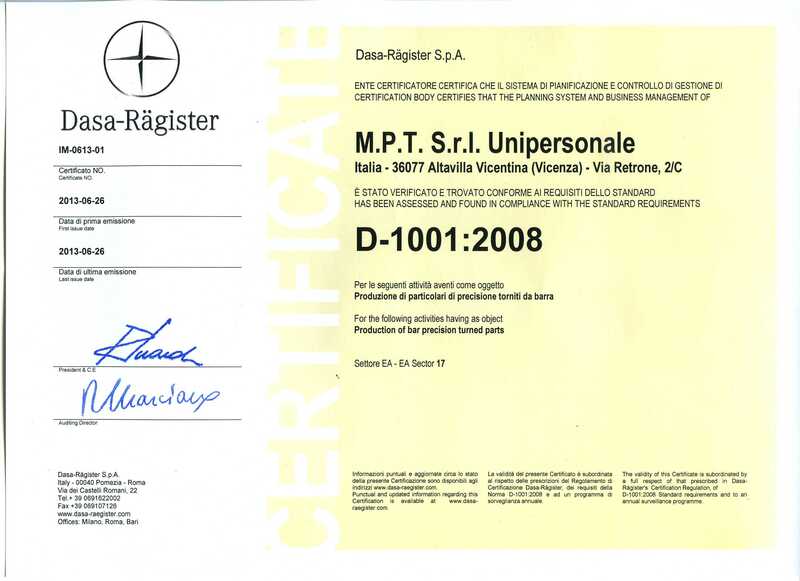 Customer care and human resources are confirmed by the certification of Quality Management System in accordance with the standard ISO 9001:2015 and the Code of Ethics that summarizes the commitment and respect MPT Srl toward the Customer, towards its employees and all parties involved in the activity. All personnel share and respect the principles contained therein. All plant and equipment are of recent purchase so as to ensure a high level of quality and reliability, as well as control instrumentation, with a new digital equipment that maintains performance monitoring and recording of information directly into the quality testing management system, for efficient traceability and statistical analysis of the collected data. We contribute with our work to keep the value attributed to the Italian technology abroad, seeking perfection without compromise. We are aware that the search for excellence and well-made things, together with firm ethical principles, can create over time value for all parties concerned. Each customer must perceive these values and find in M.P.T. Srl an excellent partner that helps him in maintaining the positions in the markets in which he operates. MPT Srl considers the management of environmental issues as an important factor for the development and for achieving the objectives. 4. take the necessary measures to preserve the resources used in its processes and to minimize the environmental impacts of its activities. The Code of Ethics sets out the principles, the rights, the duties and the responsibilities of MPT Srl in respect to all parties with whom it enters into relationship and aims to set the standard of reference and the rules of conduct designed to orient the conduct. The principles contained in the Code of Ethics also integrate the rules of behavior that the staff is required to comply, in accordance with the regulations, contracts of employment, internal procedures, and codes of conduct dictated by daily collective wisdom. Relationships with Suppliers and Customers are marked with principles of fairness, cooperation, loyalty and mutual respect. The director of the company, employees and consultants of our company carry out the activities in the interest of the company itself with the utmost cooperation in order to maintain a cohesive and active team. Our company acts, in carrying out its activities, in accordance with the laws and regulations in force in the territories in which it operates, as well as with this Code of Ethics and with corporate procedures, applying them honestly and fairly. Our company guarantees the confidentiality of sensitive information and data subject to processing and protection of information acquired in relation to the work performed and ensures that the information obtained is not used for its own interests in order to gain unfair advantage or in a manner contrary the law or to cause harm to the business objectives. Our company is committed to promoting respect for the physical, moral and cultural development of the individual, as well as to ensure working conditions that respect the dignity of the individual and workplace suitable safeguards and promotes the value of human resources in order to improve and increase the knowledge and the skills possessed by each employee and contractor. The commitment of our company is to protect the environment and to pursue ecological sustainability in all its activities. The balance between economic initiatives and environmental requirements is pursued in accordance with national and international standards. Our management system and our organization meet the ISO 9001:2015 standard and the D-1001:2008 requirements. The company is committed to being attentive to the needs of the market and to ensure a better quality of products and services offered to customers. We perform and ensure consistent quality level, scheduled improvements and investment in test equipment in order to have the latest technology to carry out with the best accuracy and reliability available.